Here at Jetpets all our travellers are special but sometimes we come across certain animals that need a bit of a helping hand. 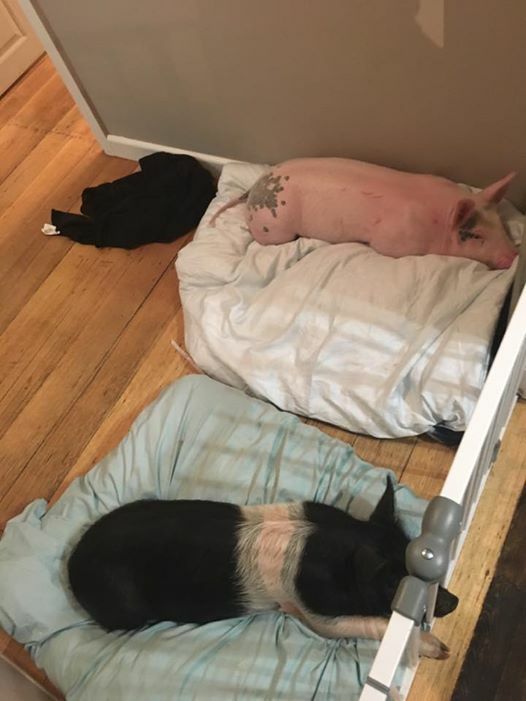 We were contacted by animal rescue operators Calley and Brad Stoll in the hope that we might be able to assist in helping “Pillow the Pig” to find her new forever home. Pillow is a female, “Large White” domesticated pig and as a two day old piglet she weighed only 800gms and measured roughly a foot in length. Pillow was rescued by the Stolls twelve weeks ago and was brought to her new foster home to meet all the other foster animals currently being cared for by the Stolls. Being an animal foster home things were already a bit crowded with 3 puppies, 3 kittens, 4 dogs and a goat all in their inner-city home in Sydney, New South Wales. But the Stolls love for animals is all conquering and Pillow quickly became part of their extended family. “Pillow knows no difference between dog, cat, pig, goat. She is loving and playful and all kinds of cheeky. 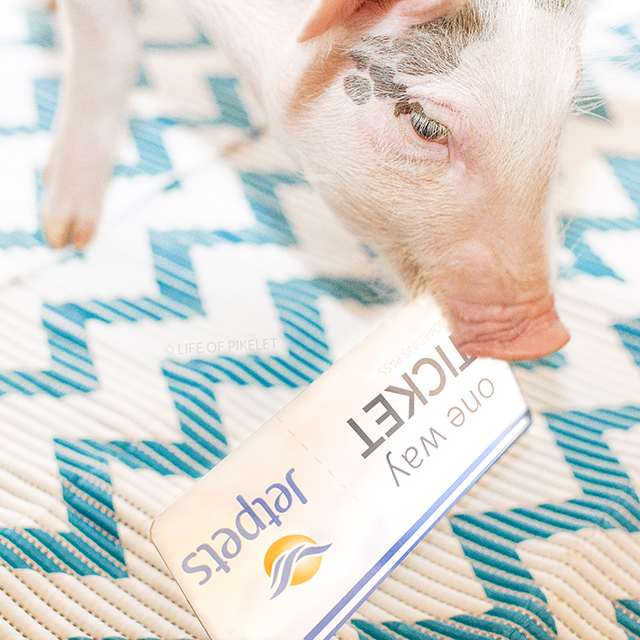 Pillow is a sensitive young pig and that comes with her highly intelligent brain”, said Calley. But with more animals needing a temporary home and Pillow growing at an exponential rate it was time to find Pillow her forever home. 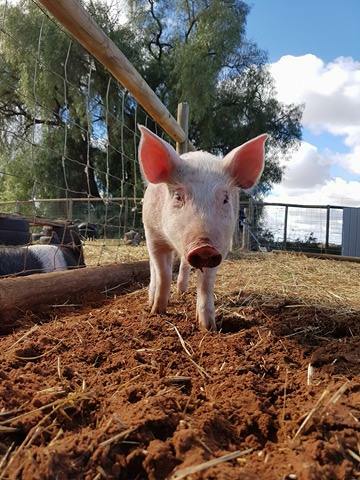 Thankfully it didn’t take long as Machela Gazzard in Mildura, Victoria got in contact with the Stolls and offered her animal rescue farm as Pillow’s forever home. 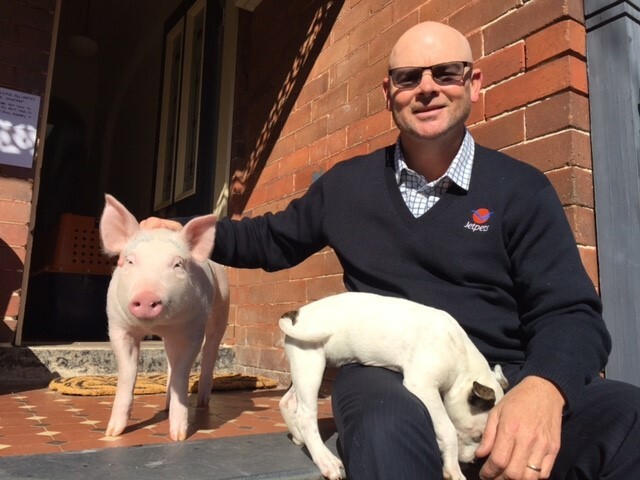 As they already owned a piglet named, Penny the decision to allow Pillow to go and live on Machela’s farm was an easy one. Jetpets arranged an extra-large crate to give pillow plenty of room to move during her 2 hour flight from Sydney to Adelaide. After a quick stop to stretch her legs and receive cuddles from our pet handlers she continued via road transport, finally arriving in Mildura after her 1,400km adventure. “Pillow is settling in well and Penny is teaching her how to be a pig which she is picking up quickly”, said Machela. “A massive thank you to the Jetpets team, particular those that had hands on with Pillow’s travel. I appreciate how safe and happy she arrived and it really is a reflection on Jetpets just how smoothly her transport went. I could not be more grateful to Jetpets”, said Calley. Uniting families is what Jetpets do best and we can’t wait to check in on Pillow in the coming months to see how this city girl is adjusting to the easy life on the farm.